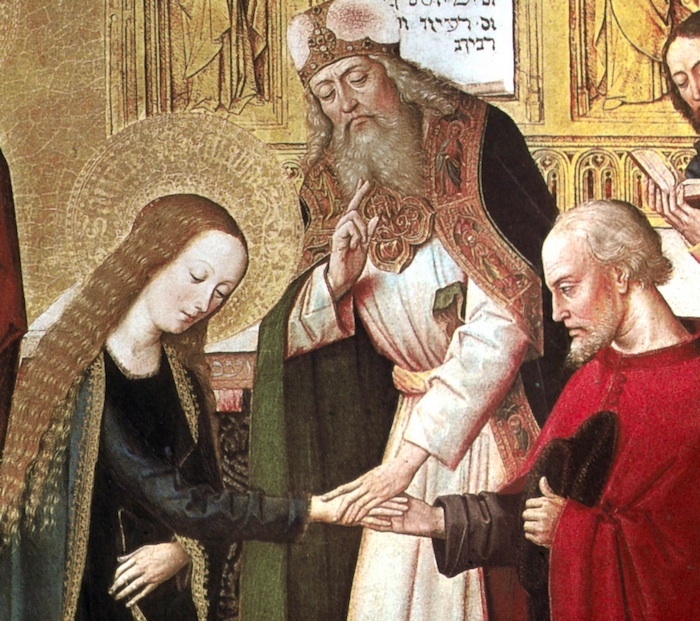 In my previous article, I discussed marriage, Holy Matrimony, catechesis, and the call of Catholic couples to live their marriage as a sacrament and a sign of contradiction. A part of that witness is in taking up our own crosses daily by making the small and sometimes even the big sacrifices for our spouses (and our children as well), for which and in which the sacramental graces of Holy Matrimony help prepare us and sustain us. All of which brings me to the comments by Fr Longenecker and Monsignor Pope about separating marriage from Holy Matrimony. I hope that the foregoing discussion shows that the two are not identical, in that marriage the institution is not the same thing as Holy Matrimony the sacrament. But neither do I think they should (or can) be separated into two separate substances. The two are in fact joined in manner which ought not be separated, lest it do harm to one or the other or both. Indeed, the two are inseparable in the same way that a man’s body is inseparable from his soul. Marriage and Holy Matrimony are as body and soul (respectively), and if there is a dualism between the two, it is rather hylemorphic in nature. This means that Holy Matrimony without marriage is like a soul without a body, form without matter: such a thing can exist–and indeed this is what our existence will be like after we die but before the resurrection—but it is not how the thing is intended to exist. I suppose that this means likewise that marriage without Holy Matrimony is matter without form—it cannot exist. Practically, what this means is that if the Church utterly withdraws from marriage as a civil institution, then she leaves this as matter without form: it is either utterly destroyed, or it gains a new form (it is “transformed”), presumably into whatever “the world” desires it to be. The vast majority of the world enters marriage (not Matrimony), and if the Church stops defending and promoting marriage, she abandons most of the human race to whatever havoc the Evil One feels like waging in its regard. But there’s still more wrong here with dumping marriage. Many Catholics enter, with the Church’s approval, not Matrimony (as in the sacrament), but marriage only (as in the natural union). To suggest that we deal from now on only with Matrimony leaves Catholics in marriages (not Matrimony) with no recognition or support. Every way you look, this is a bad idea. So having the Church give up on marriage plays right into the demons’ hands. And in the end, we gain nothing from doing this. In fact, something similar has been tried in the US (and elsewhere) with the recognition of “civil unions” (which could be extended to gays, for example). Such civil unions could confer virtually everything that marriage confers short of the name and the legitimacy which goes with that name. Rather than seeing a large movement towards supporting civil unions (and stopping there), even toward the government’s recognizing only “civil unions” (for both heterosexual couples and for homosexuals), especially in light of a variety of state amendments which legally defined marriage in the only way which is ontologically possible (between one man and one woman), we saw the homosexualist movement redouble its efforts to redefine marriage. Note that in the eyes of the law, there is nothing which prevents a civil union from carrying all of the same benefits–economic, political, etc–as an actual marriage. The government could even cease to use the word “marriage” in terms of civil unions, though it would be a mistake to do do. The push for gay “marriage” is not, never has been, and never will be about equal rights alone. If it was, there would be a bigger push to recognize gay civil unions upon which may be bestowed any of the secular rights for which gays themselves have clamored (e.g. joint property ownership, hospital visitations, etc). There is little if any such push (indeed, in places where such civil unions are recognized, there is still a push to legalize gay “marriage”). There would, moreover, be far fewer lawsuits by homosexualists against businesses (and individuals) which refused to provide services for “gay marriage” ceremonies (under any name). The thrust of the homosexualist movement  is not—or at the least is not primarily limited to—these so-called “equal rights,” though this does provide a nice-sounding slogan to march under. Rather, it is to legitimize gay relationships, to push until society does not recognize the difference of the distinction between homosexual and heterosexual relationships—and to punish any who will not go along with this program. It is also to destroy marriage as an institution, as some of the homosexualists have stated. Changing the name of marriage in the Church to holy matrimony will resolve none of this. So long as any distinction exists between what gays are recognized to have and what a heterosexual union has, there will be an outcry amongst the homosexualists, and a demand for change. Civil unions may be determined by what the civil authority (the government) dictates, but the sacraments belong to the Church. These cannot be changed by any power on earth, including the Church herself. Nor can the grace which comes with the sacrament be bestowed by any other means, because grace is a very particular thing. The particulars of the grace of marriage cannot exist outside of the bonds of Holy Matrimony, and it cannot exist for purposes other than those found in Holy Matrimony: procreation, and unitive intimacy between complementary spouses. Neither of these things can exist outside of a traditional, heterosexual marriage; this is not something which the Church has been given the authority or even the power to change, but only to preserve and teach. No governmental dictates, social pressures, or civil pronouncements can alter that. But this does not mean that there won’t be attempts made at this, nor that some churches—even some Catholic parishes—will cave under the social pressure. We would, moreover, be foolish to think that simply retreating from this front in the so-called culture wars will mean that the battle ends here. It’s worth remembering who our real enemy is in this “culture” war—and that his goal is not just the conquest of the culture, but the destruction of the Church herself. If that is not necessarily the goal of the homosexualits, then there are nevertheless all-too-many people in that movement who are willing to help with that goal. They aren’t going to stop at demanding the change (and even the destruction) of the social institution of marriage while leaving Holy Matrimony untouched, any more than Satan will stop at the destruction of the body while leaving the soul uncorrupted. It’s worth reiterating here a distinction I’ve made a few times before between homosexuals and homosexualists. I have no quarrel with the former to the extent that they want to live in peace. Sure, I acknowledge that they are sinners–we all are!–and I do not support their desire for “gay marriage” (I don’t think it’s ontologically possible), nor do I think that they ought to enter into civil unions (again, on moral grounds). However, to the extent that all they are seeking is legal recognition of the rights of their relationships, I am largely sympathetic, and can even support the legal recognition of civil unions. The latter group–the homosexualists–are the real driving force of the culture war, and their goals are the further destruction of marriage and the punishment of anyone who disagrees with them. They are John C Wright’s “Neobarbarians” and Mark Shea’s “Gay Brownshirts.” Some of them are honest enough to admit it. Not all homosexualists are homosexuals (which is admittedly a different use of the word than that found in most dictionaries). Do you Have a “Rite” to Marry?